A couple of months on, I can look back on HOMD’s early alpha release with a nice sense of perspective, and all told it actually went very well. There were many reports of instability and poor collision detection, but both of these major bugs were fixed within a week. One bit of feedback I didn’t entirely expect, however, was the trouble that people had with the combat system. It was either much too easy or unfathomably difficult, with no reports of anything in-between. This honestly baffled me for a few days, but then I realized – nobody had much idea what was going on. If you have no idea what’s going on and then you win, that’s too easy. If you have no idea what’s going on and then you die, that’s too hard. There’s a rule of strategy gameplay that I strongly believe in – the Sid Meier rule, coined by the Firaxis mastermind himself. “A good game is a series of interesting choices.” Sadly, and it pains me to admit it, the old combat system failed this test. Luckily, I think I fixed it. Yeah, I’ve been quite busy. In addition to GDC, writing story content, Rezzed, bugfixing, and dodging angry bees, I utterly overhauled the old combat system and made it turn-based. 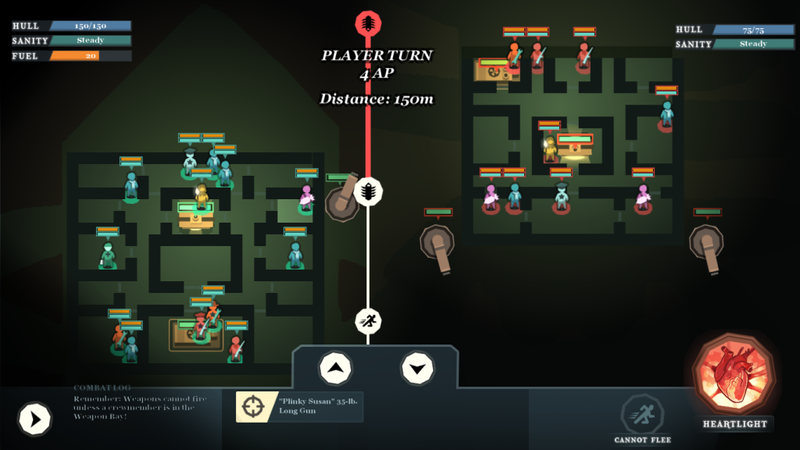 Combat now consists of you and your enemy taking turns, with each of you allotted 4 actions per turn. An ‘action’ means aiming your weapon, moving a crewmember, or advancing/retreating with your kinetopede. 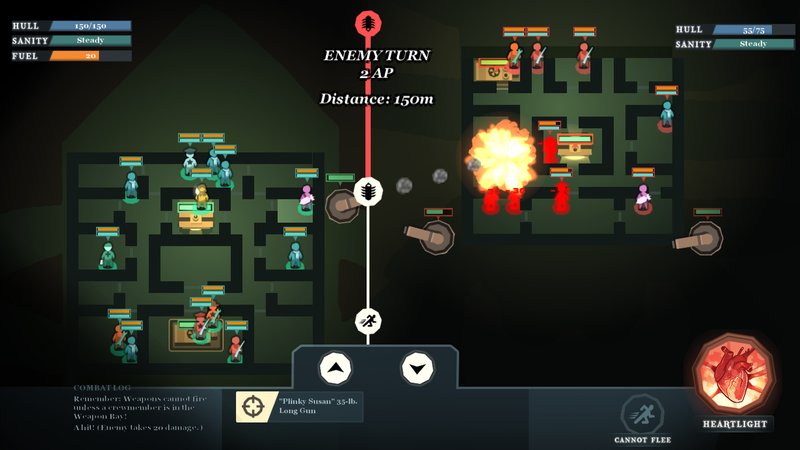 When your crew and the enemy crew are in melee range, they do damage to each other automatically at the end of every turn. This change suddenly unlocks a whole new world of strategic, Sid Meier-approved decision-making! Do you charge your kinetopede all the way forward on the first turn, a short-term sacrifice for potential long-term reward? Do you prioritize firing a missile this turn, or getting your Captain out of the range of that boarder? 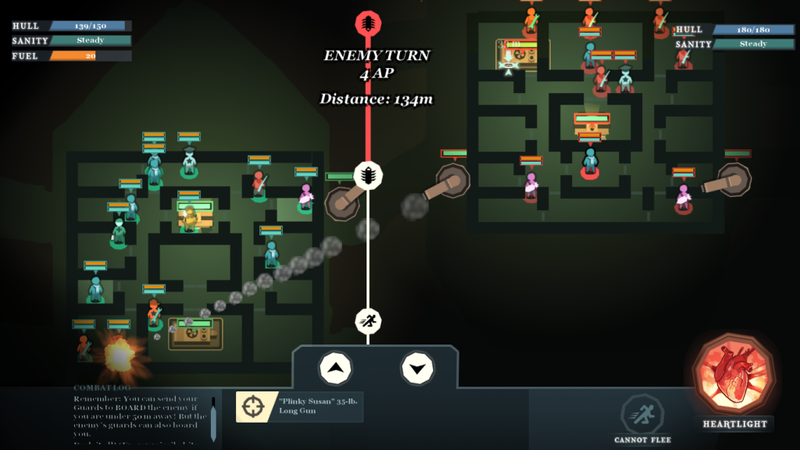 Even more importantly, making the combat turn-based provides clear demonstration of cause-and-effect. The complex interplay of mechanics – mechanics which were always present – are now much more obvious. Back when it was mostly invisible to the player, by contrast, the complexity was pointless. The entire time I was implementing this change, I was worried sick that I was wasting my time on a huge dead-end. I was worried that when I released the alpha to KS backers, they’d like it even less than the previous system. This is still a worry, of course, but to mollify my fears I gave the combat a quick trial run at Rezzed – where I was able to see, up close and personal, people enjoying the new combat system so much that they would actively seek it out, to the point that it was hard to tear them away from the screen! Debuting the new system at Rezzed let me catch the most obvious bugs in real time, but now it will be undergoing a deeper, more rigorous test – under the scrutiny of those backers who have access to the alpha! The new combat system will doubtlessly have introduced new bugs, so I’d be grateful for any testing you can do. The House is now ~30% smaller and totally restructured, so the player spends less time travelling. You can now save while exploring! And other minor UX tweaks. New map, new inventory icons, new Noctoscope, new character art. New stories, quests and encounters. Major bugfixes (including the issue where some neutral roaming kinetopedes failed to despawn and would run in circles forever). Other things, some of which are secret, some of which will be highlighted in later devlogs. As always, only test the alpha if you don’t mind encountering horrible bugs and unfinished content. Have fun!